Green off-peak energy for the construction industry. The enclosure is unique in conception to offer 2 installed generators with all of the security features of the SafeGen. Why 2 generators? Well the TwinPak is the first designed product to offer the construction industry GREEN off-peak electricity. This is achieved by having a larger generator operating during the day and a lesser model running at off-peak periods. You can achieve a saving of up to 723.2 litres (see example below) . 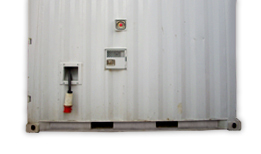 We can offer a number of combinations of generator options to suit power requirements. Control can be manual night/day or upgraded to automatic without loss of power (peak lopping). TwinPaks are available with or without the generator(s) enabling you to use your preferred supplier. TwinPak is the first product to offer the construction industry Green off-peak electricity. You could save 723.2 litres1 of fuel per week, saving the earths resources, your carbon footprint and £506.242 of your money. 1 Using published data from FG Wilson models P65-1 & P22-4 running at 75% load prime. 2 Fuel at 70p per litre [January 2011]. The container-base fork lift pockets ensure movement of the unit, empty or loaded, is simple. The alternating sets can be upgraded to automatic without loss of power, giving you one less thing to worry about. The 2100 litre bunded fuel tank has an extended running period in excess of 7 days for most models of generators. Two lockable door bars, a heavy duty door lock, secure cable entry/exit points, cable clamps and the fill/vent pipes fitted with a heavy duty grill ensure security.